Fourteen graduating seniors will take the stage at Dartmouth’s Commencement ceremony as part of the 2017 Commencement Principals, a group of seniors and a faculty speaker nominated by the Class of 2017 to speak and serve a variety of roles at Commencement. The Principals include the class orator, class historians and class marshals. This year’s Class Day Faculty Speaker is English professor Aimee Bahng. The nine class marshals who were nominated and selected are: Dillon Rich ’17 as Head Marshal, Dennise Hernandez ’17 as U.S. Flagbearer, Brendan Barth ’17 as Dartmouth Flagbearer, Logan Henderson ’17 as Left Outside Marshal, Thuy Le ’17 as Left Inside Marshal, Asha Wills ’17 as Right Inside Marshal, Mary Sieredzinski ’17 as Right Outside Marshal, Abena Frempong ’17 as Left Gauntlet Marshal and Jake Donehey ’17 as Right Gauntlet Marshal. The four class historians are Robert Cueva ’17, Nicko Gladstone ’17, Terren Klein ’17 and Elise Wien ’17. The class orator is Iman AbdoulKarim ’17. The 2017 Class Council sent an email to the entire Class of 2017, soliciting nominations. A committee then reviewed the nominations and made final selections based on their knowledge of nominees and who would be suitable for each role, Gladstone said. Barth said that Frempong, who is vice president of the 2017 Class Council, reached out to him and the other Principals to ask if they were willing to accept their positions. Barth did not know that he had been nominated prior to being notified by Frempong and also did not know much about what the position would entail. 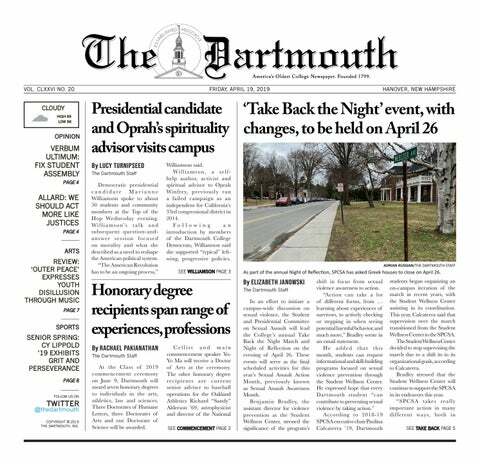 Barth said that his nomination made him realize that he has had an impact on the Dartmouth community. Gladstone said he knew that a lot of his friends had nominated him before he was formally notified and said he is happy to be able to contribute to Dartmouth one last time. As a class historian, Gladstone will come up with a sketch or presentation that embodies the class’s time at Dartmouth that is “funny in a tasteful way,” Gladstone said. Bahng said she was very honored to receive the nomination for faculty speaker by students, particularly given the circumstances surrounding her tenure denial last year. “It was an incredible recognition of my time and service to this institution, but I also wonder to what extent people wanted to hear about my personal experience negotiating this institution even beyond the denial of my tenure,” Bahng said. She added that she cannot speculate how administration feels about her selection, but her faculty friends are excited and have been quite moved by the gesture. “As one of my friends put it, ‘The students are giving you the opportunity to literally have the last word,’” Bahng said. Bahng said she had to carefully consider the position before accepting because she wanted to make sure she could speak to the spirit of the Class of 2017 without focusing the speech on her own experiences. Bahng said she will take her speech as an opportunity to reflect on her seven or eight years at Dartmouth, and the “things [she] has tried to build with” the Class of 2017. When AbdoulKarim found out she had been selected as class orator, she was surprised and honored, she said. She added that she was humbled by thinking about why people wanted to hear her speak and commemorate the class’s four years here, given her activist work and political beliefs. “I think that I have had a pretty consistent voice on campus during my four years here,” AbdoulKarim said. She noted that her thesis is on Muslim women in the Black Lives Matter movement and said that she thinks her beliefs, activist work and vocal presence in conversations about race, sexual orientation and class were part of the reasons she was selected. “I think it would be disingenuous to myself and why I feel I was nominated if I didn’t bring up the things that I am always talking about and that I’m passionate about, which is social justice and strong ethics,” AbdoulKarim said. She added that she was surprised that Bahng was selected as this year’s faculty speaker. “Just seeing the people on the list who are going to be speaking that day, I don’t think that anyone would not assume that of course a lot of politics are going to come up, just by virtue of the people who are nominated,” AbdoulKarim said. She added that while her experience as a black Muslim woman on this campus does not reflect the experiences of the majority of people on campus, she is nonetheless looking forward to talking about her experience with the campus community of women of color.